16.1 PPG, 14.6 RPG, 2.2 APG, 3.9 BPG, 1.2 SPG, and 2.7 TOPG on 63% shooting and just 47.8% from the free throw line. His sophomore season stats are very similar to his freshman season stats, with a better FG% (56% freshman season) and lower FT% (shot 59% from the line as a freshman). Can get bothered in the paint easily? Overall, Williams’ game is currently defined by his athleticism and raw tools. Early in the season after returning from suspension, Williams was outplayed in matchups against DeAndre Ayton and Chimezie Metu, both first round prospects. Williams is a great interior defender, but has shown struggles on the perimeter. He is slow laterally, meaning defenders can easily take him off the dribble, which makes Williams rely on heroic blocks on the recovery. However, he needs to prove that he can impact the defense without blocking shots. He sometimes gets bothered by stronger players and quick post moves, which could limit his impact as an interior defender. Williams’ length and athleticism help him on both ends, both attacking closeouts on defense and showing potential in the P&R offensively. Whichever team selects Williams will be banking on his upside. Williams is considered a boom-or-bust player. Fit with Mavericks: The Mavericks likely won’t select Williams with a top 8 pick that they are projected to have, but if the Mavericks trade back in the first round, Williams is a viable option. Picking Williams or passing up on Williams would show what the Mavericks believe their timeline to be – if the Mavericks select Williams, the Mavericks are likely going to undergo another rebuilding season due to Williams not being an NBA ready player in terms of impact. If the Mavericks pass on Williams for a player with a higher floor (under the circumstance that the Mavericks trade down), the Mavericks would clearly be looking to compete for a playoff spot in the 2018-19 season. If the Mavericks select Williams, he will likely serve as a bench energy big or rim protector. Adding Williams could make Salah Mejri’s time in Dallas come to an end potentially, as Williams’ role would be very similar early on. If Williams can develop a 3 point shot, he would fit better with Dallas than almost any other team. 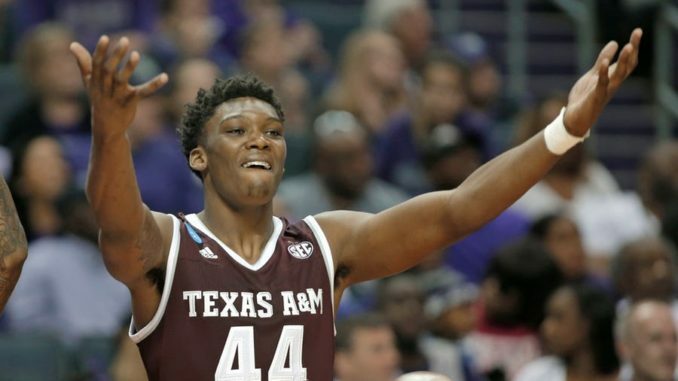 Best fit in projected range: While this range is currently teams that have an earlier pick, the best fit for Robert Williams is the Philadelphia 76ers. The Sixers will have only Joel Embiid guaranteed for next season, but are likely to pick up Richaun Holmes’ team option. Richaun Holmes is a comparable player to what Robert Williams can become, but Holmes is not considered a long term piece, given that he is set to become an unrestricted free agent in 2019. Williams can potentially grow his jump shot, and he may not need to play many minutes depending on free agency. Philadelphia’s player development has been strong over the last few years, so it’s easy to envision a scenario where Williams hits closer to his ceiling than his floor in Philadelphia.